Through our research with Spirited Life, we discovered a particularly surprising finding: pastors show high rates of job satisfaction, along with high levels of job stress. While there are a few theories behind such a contrast, pastors admit their love of the Church does come with a unique combination of stressors. For example, most pastors devote well over forty hours each week to sermon-writing, hospital visits, and committee work, yet they continue to hear from church members that they “only work on Sunday mornings”. This misunderstanding of the nature of pastoral work is one of many consistent issues faced by clergy. 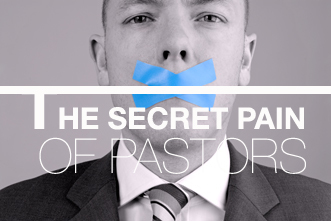 In the article entitled “The Secret Pain of Pastors”, Pastor Philip Wagner names and explores six common problems that clergy face. Those problems are listed below and include quotations offered anonymously from various Spirited Life pastors. 1. Criticism. With so many structural changes within denominations, pastors are often assigned fault for a church’s lack of growth, sermon length, service length, and lack of interest in community outreach, among other complaints. We have heard from many of the pastors in Spirited Life how criticism can come in many forms, either directly or indirectly, including withheld offerings. The sense that pastors should be perfect often feeds into this tension. 3. Betrayal. Pastors learn to trust their church members, but they also experience violations of that trust, sometimes in the form of “telling the pastor’s personal issues to others,” according to Wagner. 4. Loneliness. One SL pastor has said that many clergy are warned to expect feelings of loneliness. “Clergy are told in seminary that their District Superintendent is neither their pastor nor their friend. This leaves clergy with no one to cover their back so to speak. Who can clergy turn to for support?” For more on this theme, check out Wellness Advocate Tommy Grimm’s blog post about the isolation experienced in ordination. Remember the Call. Think back to your first hint that you were Called to ministry. Was it a ‘Damascus moment’ or a ‘Slow Glow’? Remember the first time someone called you Pastor. Too often, pastors deal with emotionally draining situations; reflecting on your Call may bring back a renewed perspective on why you entered ministry. Steal away and pray. Take your Sabbath! Kate Rugani reminds us in her article that ‘Self-care is not self-ish’. Remember that you are NOT alone. You are not the first member of clergy to face any of these challenges. Seek counsel of clergy outside of your denomination. If you are a pastor in the Spirited Life program, this is an area where your wellness advocate can provide a listening ear while also helping you find ways other support resources. This entry was posted in Inspiration, Spiritual Health, Stress & Mental Health, Tips & Tools, Vocational Health, Voices and tagged articles, depression, inspiration, resources, self care, spiritual health, vocational health by Angela M. MacDonald. Bookmark the permalink. Angela is a Wellness Advocate for the Clergy Health Initiative. Angela earned an MDiv/MSW; a joint graduate degree program sponsored by Duke Divinity School and the UNC School of Social Work. Angela is also an ordained Elder in the African Methodist Episcopal (AME) Church. Angela’s past experiences includes parish ministry, crisis intervention counseling and legal technology consulting. Angela enjoys reading, international travel and "I love lamp". Also, we are NOT alone. Reach out to the UMC pastor down the street. Go to lunch. If not a UMC pastor, reach out to another pastor in the community. The connection is what is important. The level of sharing can grow if the connection is a good confidential match. Marilyn – thank you for your comments! I think more and more pastors are being more intentional about making those connections; they really are lifelines for so many!